Adams County marked the commencement of new terms for four elected officials and several judges in an Inauguration Ceremony on Tuesday, Jan. 10 at the Waymire Dome at Adams County Regional Park in Brighton. Residents, employees, and family and friends filled the Dome to watch the proceedings. Commissioners Henry and Tedesco and DA Young were re-elected to four-year terms while Commissioner Hodge is new to the Board. "I am so excited and ready to go to work," Commissioner Hodge said in an interview following the ceremony. "I'm looking forward to being able to be part of the solution." 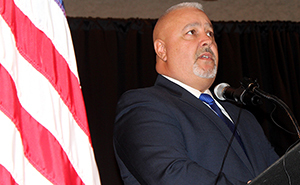 "Growing up in Adams County and being able to represent is definitely an honor, and I couldn't have done it without the support of our constituents," said Commissioner Tedesco. "I want to make sure that we finish what we started. ... I want to make sure that we get things done." DA Young praised his staff during his speech following his swearing in. "I am looking forward to the next four years because I know I've got the best office in the state of Colorado," he said. "Everyone in that office is in it for the right reasons. They're in it to do the right thing." Judge Flaum took the oath of office for the first time as an Adams County Court Judge. "It was really a humbling experience to be onstage with so many people that I've worked with for such a long time," he said after the ceremony. "I'm very excited about the future of the bench here in Adams County."